Maui Now : Stand for Aloha Rallies and March Planned Against Aloha Poke Co. The protests are being coordinated by a coalition of Native Hawaiian organizations from Chicago, Hawaiʻi and Alaska. The coalition is led by Lanialoha Lee of the Aloha Center Chicago, a multi-media resource cultural center in Chicago dedicated to the preservation and perpetuation of Native Hawaiian and South Pacific Arts. Organizers say the protests are in response to the Aloha Poke Company sending cease-and-desist letters to poke restaurants in Hawaiʻi, Alaska and other places “demanding that they stop using aloha in their names.” Aloha Poke Company claims to hold the trademarks for aloha and poke. Organizers say “Aloha means love, hello and goodbye in the traditional language of Native Hawaiians, the indigenous people of Hawaiʻi. Poke is a traditional Native Hawaiian dish of small, cubed raw fish that is becoming popular throughout the United States.” The controversy, organizers say, has “outraged” many in the Native Hawaiian community. An online petition against Aloha Poke Company already has received more than 160,000 signatures. 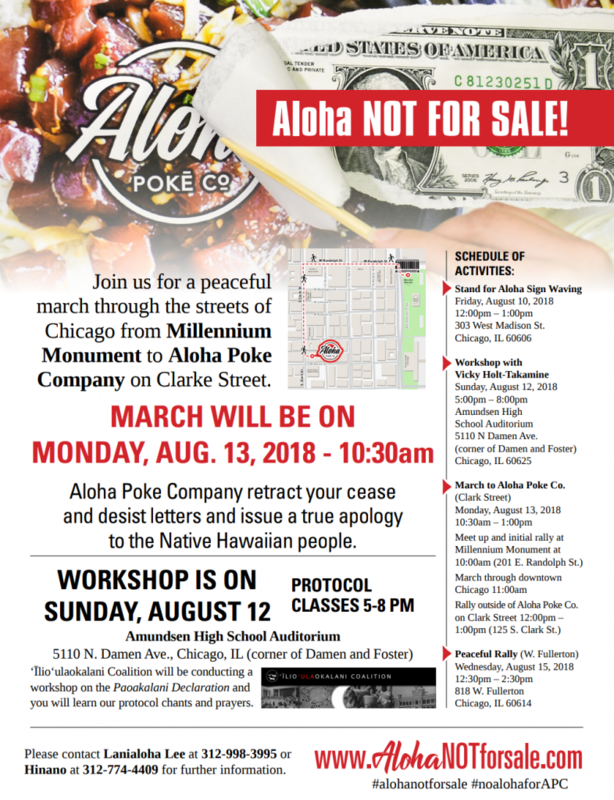 Joining the protests in Chicago will be members of the Kahele family, the owners of the poke store in Anchorage, Alaska, that received a cease-and-desist letter from Aloha Poke Company. To avoid potential litigation, the Kahele family recently re-named their store Lei’s Poke Stop. 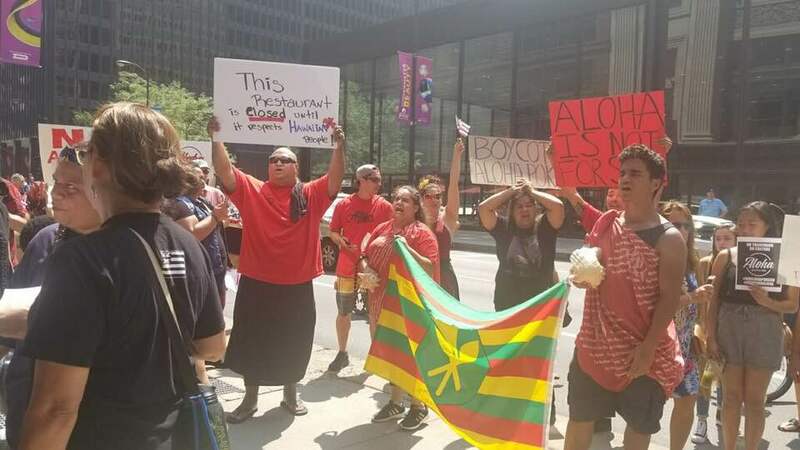 March through downtown Chicago 11 a.m.
ʻĪlioʻulaokalani Coalition – ʻĪlioʻulaokalani Coalition is a Native Hawaiian political advocacy organization comprised of kumu hula (hula teachers) and other cultural practitioners. Founded in 1997, the coalition has been at the forefront of advocating for the protection of Native Hawaiian rights, culture and land. ʻĪlioʻulaokalani held conferences on Native Hawaiian intellectual property rights in 2003, 2004 and 2007. The first conference led to the adoption of the Paoakalani Declaration, a statement affirming the Native Hawaiian people’s collective right, as the creators of their traditional knowledge, to protect their cultural expressions from misuse by individuals who behave disrespectfully and inconsistently with their worldview, customs and traditions. 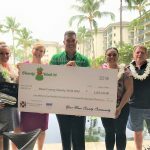 Council for Native Hawaiian Advancement – CNHA is a member-based Native Hawaiian nonprofit organization led and governed by a 21-member board of directors elected by its 160 due-paying members, which are Native Hawaiian organizations and business owners. Its mission is to enhance the cultural, economic, political and community development of Native Hawaiians. Native Hawaiian Advocacy Group Explores Lawsuit Against Aloha Poke Co.